Lomé, Togo, Tuesday, 31st July 2018 His Excellency President Julius Maada Bio received ovation at the opening ceremony of the 53rd Ordinary Session of the Authority of Heads of State and Government of ECOWAS held in Lomé, Togo. The ovation came during the opening statement of the ECOWAS Chairman, President of the Togolese Republic, H.E Faure Essozimna Gnassingbe who singled out President Bio to welcome him to his maiden ECOWAS Summit and congratulated him for his election as President of the Republic of Sierra Leone. As President Bio rose to his feet in the midst of wild applause from his colleagues, officials of ECOWAS and members of various delegations, you could sense the goodwill for his presidency to be a great success. 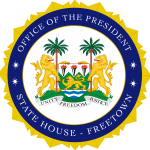 The election of His Excellency President Bio and his outstanding achievements within his first 100 days in office have not only improved Sierra Leone’s reputation internationally but also many of his colleague Heads of State and Government in the continent see him as both refreshing and inspiring. Beyond the African continent, President Bio’s resolve to fight corruption and the impressive economic recovery by his Government have demonstrated that His Excellency President Bio represents the new emerging leadership in Africa that is economically prudent and serious in the fight against corruption. In another development during the opening session of the 53rd Ordinary Session of the Authority of Heads of State and Government of ECOWAS, the first Sierra Leonean Judge, Justice Kekura Bangura was one of five Judges who took oath to serve in the ECOWAS Court of Justice. Before his appointment, Justice Kekura Bangura was a high court judge with over twenty (20) years of legal experience.